A New Era for KTM. The 790 Twin Duke. You are here: Home › A New Era for KTM. The 790 Twin Duke. 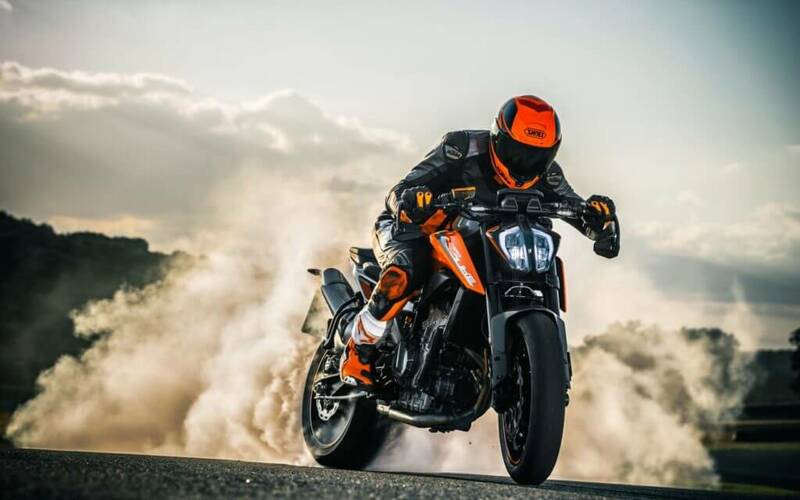 The KTM 790 Duke was designed with street riding at the forefront, although the spec sheet suggests the 2018 KTM 790 Duke will be just as competitive on the track. 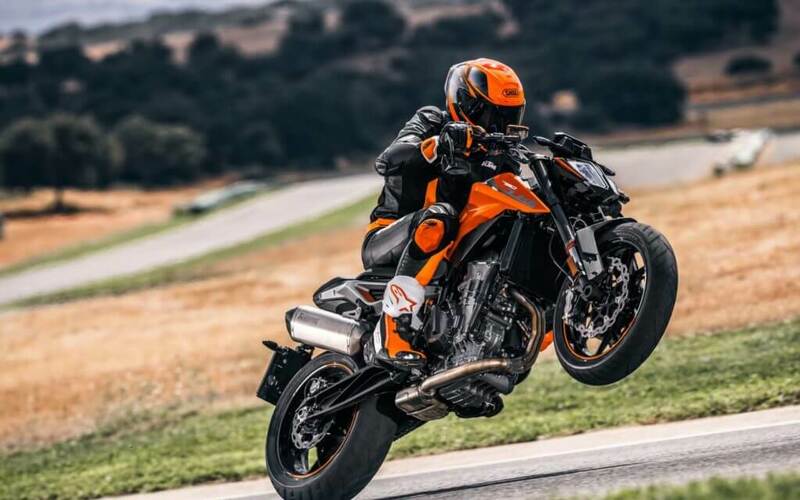 The 2018 KTM 790 Duke will use KTM’s all-new 799cc LC8c parallel-twin engine. Featuring a claimed 105 horsepower @ 9000 and 63 ft/lbs of torque @ 8000 rpm, the counter-balanced parallel-twin engine has specs that suggest it’ll enjoy having its rev-range explored. Four main riding modes include Sport (lowest intervention of electronics), Street, and Rain (maximum intervention.) Additionally, a customizable Track mode is available. Plus there’s a supplemental riding mode: Supermoto. Available as a additional mode that can run concurrently with the four main riding modes, Supermoto disables all restrictions to the rear, including traction control and ABS, allowing you to lock the rear wheel and slide around as you wish. The 790 Duke riding combats wheel hop in two ways: a slipper clutch and “Motor Slip Regulation,” both of which are standard items. A mechanical slipper clutch helps the risk of locking the rear wheel or causing chassis instability due to wheel hop during a botched downshift. Complimenting that mechanical system is an electronic aid known as “Motor Slip Regulation,” which steps in when engine drag torque is too high. The ride-by-wire system balances the throttle to help ensure smooth deceleration. In short, MSR actively adjusts and monitors engine braking. 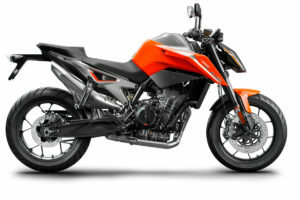 The 790 Duke is light, with a claimed wet weight of 189.6 kilos. A steel trellis frame uses the 799cc motor as a stressed member to save additional weight. 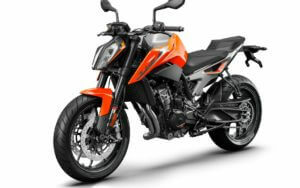 KTM’s middleweight street fighter is low, with its 82 centimeter seat height. WP suspension keeps the rubber to the road with a non-adjustable 43mm fork on the front and a mono-shock with a progressive spring and preload adjustment on the rear. Brakes are dual radially mounted four-piston calipers, biting down on 300mm rotors. In the rear, the 790 has a single piston caliper with a 240mm disc. A steering damper is standard. Keeping you safe from tank slappers is a non-adjustable steering damper. The 790 Duke is equipped with a full color TFT instrument display. A comprehensive IMU-supported electronic package will be standard. Featuring lean-angle-detecting traction control, cornering ABS, wheelie control, as well as launch control, the new Duke has an electronics suite well above the status quo for its class. And forget the clutch; an up-and-down quickshifter is standard equipment.